It's holiday time!! On the weekend before Easter, I realized there are only three months left. It makes me really sad that I have to leave this unbelievable adventure pretty soon. Of course I am excited to see my family and friends but I know I will live my "boring" life again (compared to this year in America). I'll have to go to school two more years which will be more difficult than the school here. I also realized that I am gonna miss so many things. Like stopping with friends at a Starbucks or Dutch Bros Coffee before a game, getting lost in those huge stores (target is my fav), not knowing what's gonna happen tomorrow, experiencing everyday something new and of course missing friends and my amazing host family. I never believed that somebody can love their own family as much as their host family but now I know that's possible. My heart is split in half: German in one and the other in American. I'll always miss a piece or something in my life, doesn't matter if I am in Germany or in the USA. When spring break started, I was surprised that we have only one week of vacation. Here in Oregon, we have Good Friday and Easter Sunday but those days aren't bank holidays. There isn't an Easter Monday and there isn't a vacation after Easter Sunday. It's different in every state but I didn’t know before. On Palm Sunday I went to church with my host family for the first time. It was super interesting to experience the American church and to be a part of it. It's also a pretty big cultural part of the life of Americans. The following week I didn't have tennis practice which surprised me. Usually I never have a week off of sports. Then surprisingly my tennis coach texted the team if we wanna be in a scene of a netflix series. I’ve always wanted to be in the background of a film or movie and here it came true. In Oregon they film a lot of movies and TV shows (i.e. Twilight, Free Willi, and Grimm). I'm super excited to be able to see myself in an American Netflix Series! 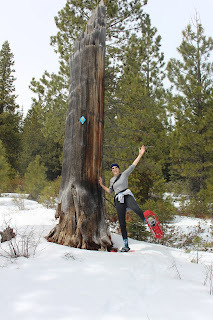 Right after this adventure, my host family and I left to go to Bend to visit family over Easter. The nature in and around Bend is really pretty. One day we went Snowshoeing what I've never done in my life. It was so much fun and we had a great time. Easter was probably my best one because we combined German and American traditions. I showed my little host sister how to decorate real eggs to hang them on trees. She never saw real empty eggs and it surprised me that in general they didn't decorate in their houses or their bushes. On the Saturday before Easter Sunday we had an Easter fire in our garden. They never heard about this Easter tradition and when I told them about it we decided spontaneously to have a little one in our backyard. 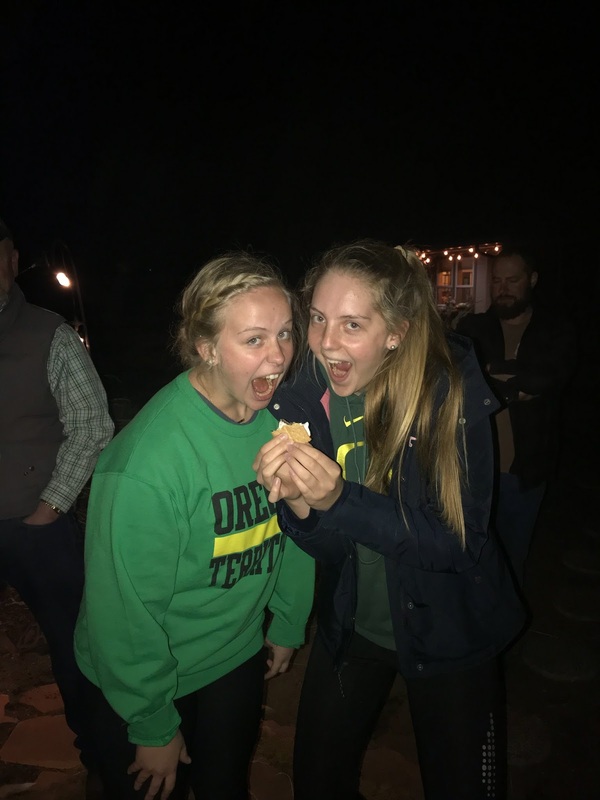 We combined it with a typical American tradition- s'mores. Melted marshmallows over the fireplace with chocolate between two Graham crackers. On Easter Sunday they showed me how they usually celebrate it. We had a traditional Easter brunch with a big variety of deviled eggs and of course colored eggs. I made my family traditional Easter bread and later we got cute Easter basket with candy. It was a really short week but with twice as much fun and action. The time is running so much! It is already April and there are only two and a half months left. I am playing tennis as a spring sport and it's almost over. 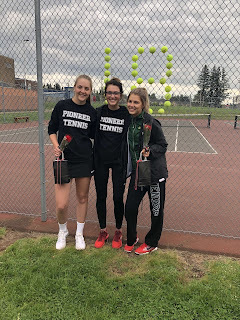 Yesterday was senior night and we had our last home match. All seniors got a little present from our coach and a speech in front of the players and families. My tennis coach is probably the funniest coach/ teacher I've ever met. The season was so much fun and I will miss playing a sport so much and of course all the girls. 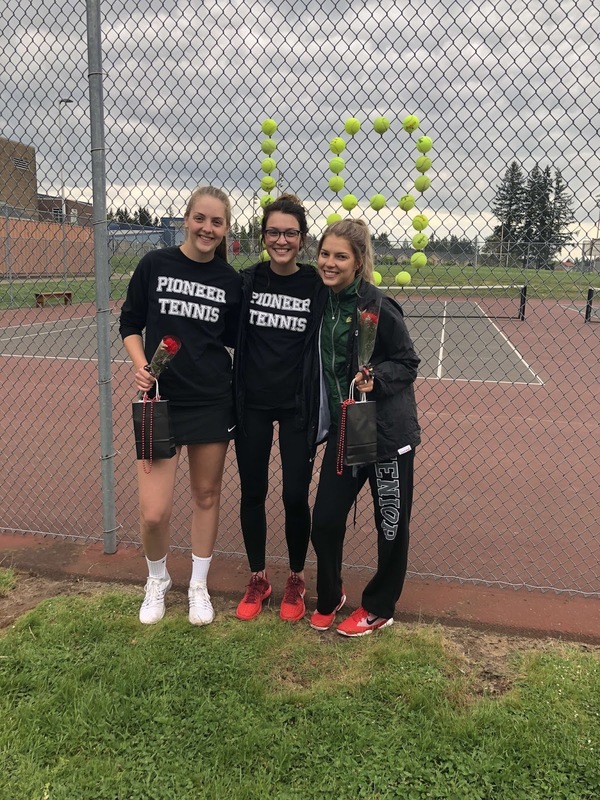 Next week are the district tennis matches in which only the four best varsity players play. Four single players and four double teams. I am super excited to play with my partner at the districts. I really recommend playing a sport. It doesn't matter if you have never played the sport. I never had a Tennis racquet in my hand before I came to the USA. 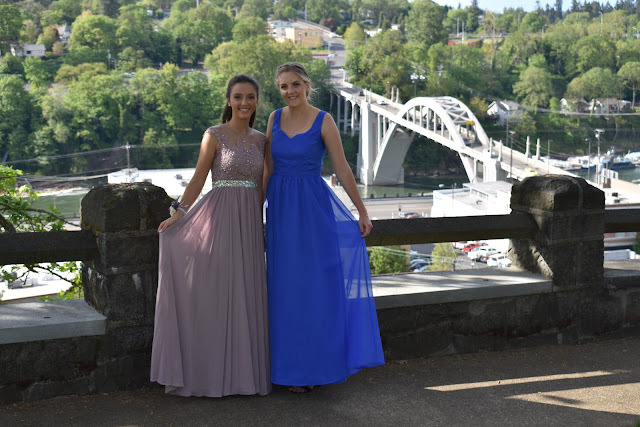 In April, we also had prom. I always thought that prom is the highlight and an important day during my exchange but only till I had found out that there are four dances during a school year. I would say winter formal and Prom are the biggest. You wear nice dresses and it's kind of a big deal. But personally I prefer Homecoming and probably the Sadie Hawkins Dance which are more informal and I think more fun. Anyhow prom was an awesome experience. I went only with my best friend (also an exchange student). Almost everybody had a date or didn't go (our friends). So we decided to go by ourselves. 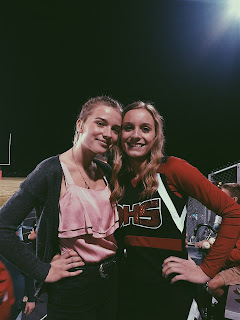 I thought that it is odd to go only with your best friend but it was so much fun and we met so many people at the dance. I would say that every exchange student should go to prom even if they don't have a date. It is a must have to go and experience it. You're getting ready with friends, doing your make up and your hair. Many are also going to get their nails done and of course going dress shopping (so fun!). Before the dance we took photos and after that we went to a restaurant (with long ball dresses). Some students go to Fast Food restaurants and then to prom. That was super weird when I just heard it but to do it and experience it is awesome. Wie erstelle ich eine Fotocollage für die Bewerbung für ein Auslandsjahr? Wir haben immer wieder Anrufe von Schülern, die fragen, wie man am besten eine Fotocollage für die Application erstellt. Daher haben wir hier ein paar Tipps und Beispiele für eine gute Fotocollage zusammengestellt. Warum ist die Fotocollage so wichtig? Viele fragen sich, ob sie überhaupt eine Fotocollage zusammenstellen müssen, da sie ja schon ein paar Fotos von sich mit der Bewerbung abgegeben haben. Unsere Antwort hierauf ist einfach: „Ja!“ ;) Die Fotocollage ist einer der wichtigsten Bestandteile Deiner Application, denn wenn die Betreuer unsere Partner im jeweiligen Gastland potentielle Gastfamilien besuchen, werden die Collagen den Familien zusammen mit Deinen Bewerbungsformularen vorgelegt. Somit bestimmt die Fotocollage den ersten Eindruck, den Du bei der Gastfamilie hinterlässt. 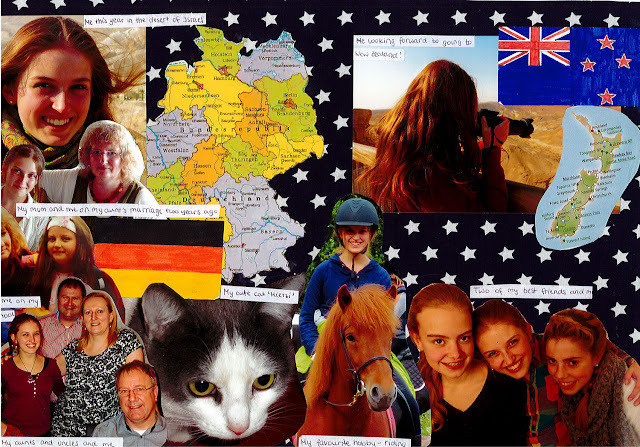 Neben dem Brief an Deine zukünftige Gastfamilie ist die Fotocollage das was die Gastfamilien am meisten interessiert.